The best proof you can get is a full demonstration either in-person or via live webcam. You can test on any wheel you want, and apply the computers for yourself. The computers are a large investment, and you need to be sure. So there’s no reasonable proof you wont see. In-person demos are in Melbourne Australia, but you can see live webcam demos from anywhere. I conduct both private and group demonstrations. You are not under any obligation to buy after a demo. But my time is limited so please do not schedule a demo unless you are already in position to purchase, with intent to purchase shortly after a favorable demo. These are conducted either IN-PERSON OR LIVE VIA WEBCAM, and are only for players with serious intent to purchase following a favorable demo. You will see the full capabilities of technology so you understand what you are purchasing. You will be able to test everything for yourself on one of the world’s most common roulette wheels. 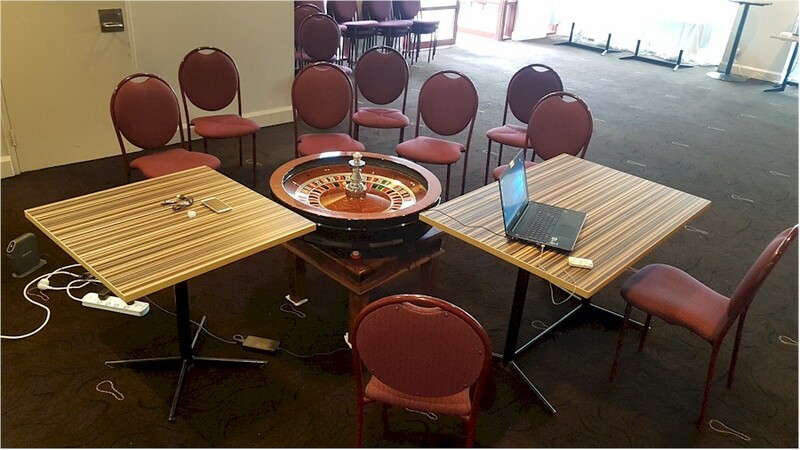 You can also bring your own wheel for testing if the demonstration is in-person, or even bring other roulette computers for comparative testing. For webcam demos, you will be able to chat me live and request verification the footage is live. You’ll see everything needed to understand how it’s used in real casinos without being detected. Below is the typical setup for 1 on 1 demonstrations. Group demos are usually done with no more than 9 attendees at a time. This ensures everyone has the chance to have questions answered. It also keeps things close and personal. This is a 2019 model wheel, which is one of the most common designs in the world. Normally we use this for demos unless you bring a wheel of your own for testing. You can spin the wheel yourself, and even disassemble it to ensure it hasn’t been tampered with. Lunch, coffee, tea and snacks are provided by the conference center staff. Usually we take a break for lunch at the on-site restaurant. You can use the free trial roulette computer to test from home. It costs nothing and there’s no risk. 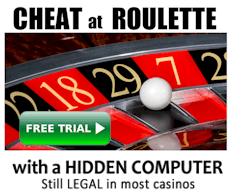 For details see www.roulette-computers.com/free-trial/. A screenshot is shown below. It uses the same algorithms as our “Lite” version roulette computer (a simplistic version). The Uber and Hybrid much more sophisticated, far more accurate, and get much earlier predictions. But you can only see them in a demonstration. Public group demos are conducted either IN-PERSON OR LIVE VIA WEBCAM, and are for anyone for any reason, even if you have no intention to purchase. Unlike with the private demos, you will not see “everything” because some parts are secret. For example, you will still see a clear demonstration of effectiveness, but the advanced features wont be explained or demonstrated to you. These demos are to give people a better understanding of my technology’s capabilities, and to address false claims from unscrupulous sellers of other technology. Also in public group demos I usually teach attendees a free technique to beat roulette. I previously conducted one group public demo per year. But due to limited time, I can now only conduct private demos (for players with intent to purchase). 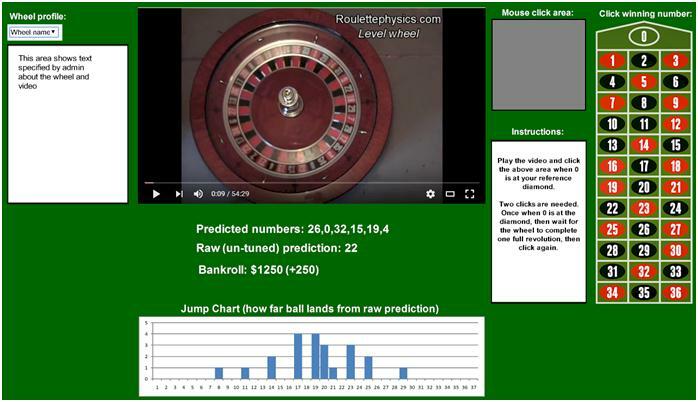 This video was also published so purchasers of other roulette computers can compare their device on the same spins. One computer from another vendor initially achieved 1/3rd of the edge, although the edge eventually evaporated to no edge at all as the ball’s deceleration rate changed. Another computer achieved no edge at all. US$500 deposit to be made prior to the demo. After clearly favourable demonstrations, some players stated they were not in a financial position to proceed for some time. My time is limited and best reserved for players in position to proceed. You are never under any obligation to purchase. But I just ask players not to request a demo until they are already fully in a position to proceed. I’ll provide a demonstration either in person or via live webcam. Because this takes my time, the deposit is non-refundable except in circumstances where “proof of effectiveness” is not demonstrated. If you decide not to purchase for any other reason, the deposit will be considered non-refundable reimbursement for my time to provide the demonstration. The definition of “proof of effectiveness” is an “edge” on a mk7 Huxley wheel with an ivorine ball, and in a manner that’s required for profit (predictions at least 7 seconds before the ball hits the rotor, and rotor speed approximately 4-5 seconds / revolution). To prove the results weren’t just “luck”, I will also provide you with a detailed analysis of the predictions and charts produced by the computer. You may take your own notes to verify the charts are accurate. This is basically to prove that even when we didn’t win on specific spins, the ball at least landed close to predictions a statistically significant amount of times. If you cancel the demonstration after I’ve booked a physical venue for the meeting, I don’t receive a refund from the venue, so your deposit is non-refundable (required amount to cover any of my expenses, including bank fees). If I’m unable to do the demo for any reason on my side, your deposit will be fully refunded. Submit the below form to register your interest to attend a demonstration. You will be contacted with further details. Private IN-PERSON Demo (roulette computers only): Only for players with intent to purchase on the day following a favorable demo. You will see everything including advanced features. 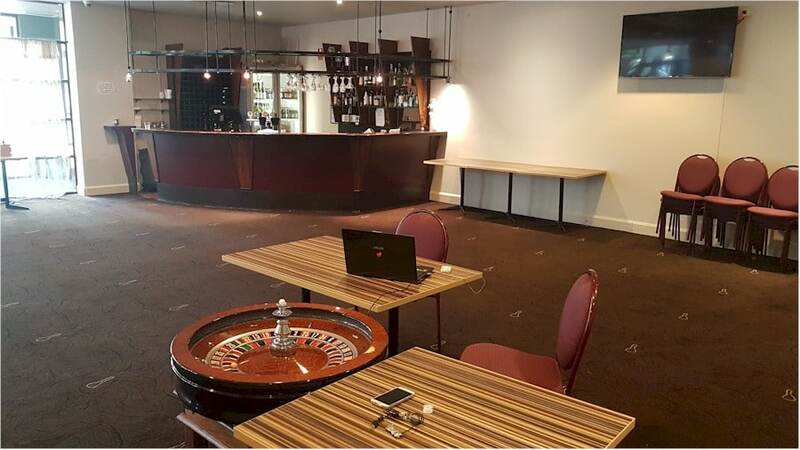 Private LIVE WEBCAM Demo (roulette computers only): Only for players with intent to purchase on the day following a favourable demo. You will see everything including advanced features. PUBLIC Demo IN-PERSON: Mainly for people who are more curious. Anyone can attend for any reason. You will see simple and clear proof of effectiveness. PUBLIC Demo LIVE WEBCAM: Mainly for people who are more curious. Anyone can attend for any reason. You will see simple and clear proof of effectiveness. For private demos I usually need 1 week to make arrangements on my end. But if you are coming from overseas, you may need more time to make travel plans. List all dates you are available for the next 6 months. Please be as specific as possible. If you want a public (group) demo, you will be assigned to a particular demonstration based on information you provide. Q. 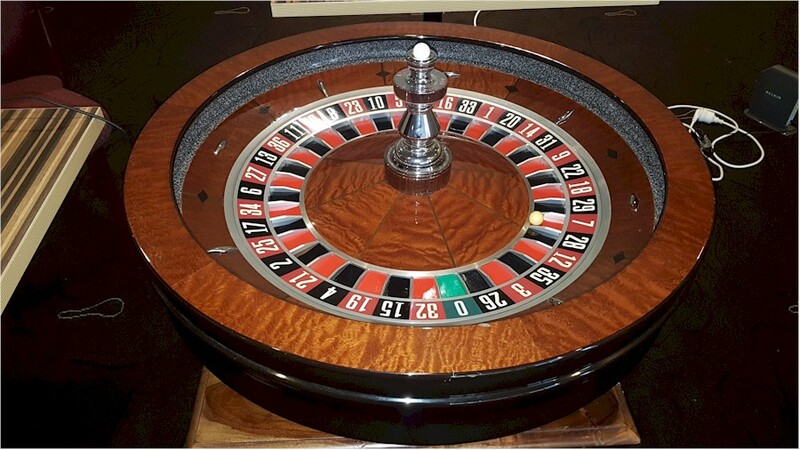 Can you demonstrate the roulette system, which does not use electronic devices? I only do demos of the roulette computers. I don’t do system demos anymore because it takes much longer to demonstrate, and the payment I receive does not justify the time it takes. But the free trial allows you to test working systems for as long as you want. Q. Can you demonstrate your roulette computers in real casinos? Real casinos spin the wheel less frequently than we can in a private demo, so demonstrations in real casinos take much longer. You need to see a statistically relevant amount of spins for proof to be clear. You would need the equipment. This includes various components like a suitable mobile phone, earpiece, induction loop, and mini camera. You would need to be trained so you know what you’re doing (which takes additional time). It takes the average Hybrid player 2-3 sessions in real casinos to be competent. You’ll need to provide details of laws that indicate computers are legal. It isn’t difficult as you can check laws on government websites, but it takes time. Computers are legal in about half of jurisdictions. So while testing in a real casino may seem ideal, it is not practical for a demonstration. Alternatively, you can video record spins from your casino, and we’ll apply the computer on those spins. You can bring the video to an in-person demo, or stream the video to me via Skype. I will be seeing the spins for the first time. But you will still need suitable equipment to covertly record video. Keep in mind it doesn’t matter if a wheel is inside or outside a casino. The physics doesn’t change. Q. What wheel are demos usually done on? You can see a demonstration on my latest wheel, which is a 2019 model John Huxley Mk7 wheel with Velstone ball track, and a bouncy ivorine ball. This is one of the most difficult wheels to beat. Learn about this wheel at http://www.tcsjohnhuxley.com/live-gaming/roulette-wheels/saturn.html. We can also disassemble the wheel so you know it has not been tampered with. 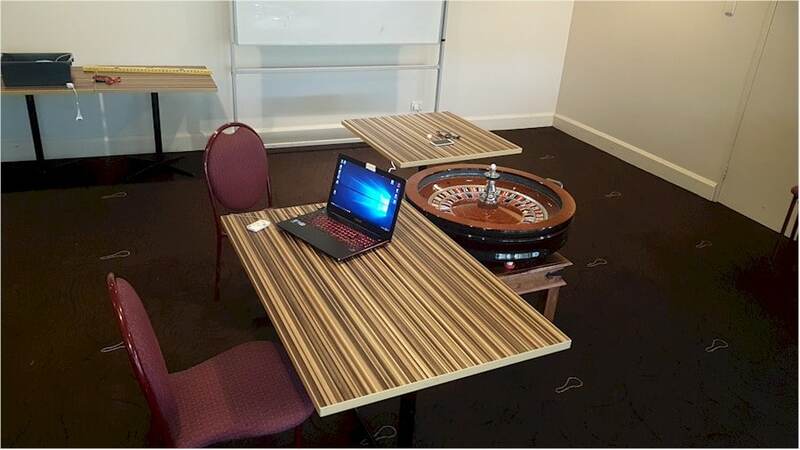 You can also bring your own wheel, or hire one from a roulette wheel hire company – although these are usually easier to beat because of poor maintenance. Q. Can you visit me to give a demonstration? No, I simply don’t have time even if you pay extra. Besides you can see whatever you need via live webcam if you are unable to travel to me. Q. Can you show me video recordings of real players winning in real casinos? Yes, but only for the Hybrid computer as it’s the only computer that uses hidden cameras. The videos are not publicly available. I can show them in private demonstrations. In addition to seeing real play, you’ll also see various capabilities such as how the hidden cameras work, and are automatically aimed at the wheel. Q. Can you test the computers on live video I stream to you via an Internet service like Skype? Yes. This option is suitable if you have your own wheel at home. Simply aim your webcam at the wheel and you will hear the computer’s predictions live via Skype. Q. Can the roulette computers be applied at online casinos? The Hybrid and Uber computers can get accurate predictions at online casinos, but only the Hybrid can actually get predictions in time to bet. But I don’t expect for much longer. This is because we have won enough to force some online casinos to call no more bets much earlier, and other online casinos may eventually do the same. 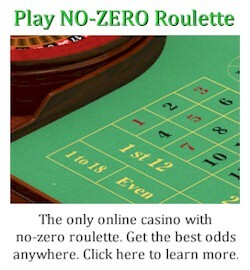 But real casinos usually only call no more bets much earlier when they suspect a roulette computer player is present. It is very unlikely most real casinos will ever forbid bets after ball release because it speeds up the game, so more bets are placed, and the casino ultimately earns more. There are far more losers than winning roulette computer players, so it is not financially viable for real casinos to call no more bets too early. Perhaps 1 in 50,000 players use a roulette computer. If casino staff in a real casino suspect you are using a roulette computer, they simply call no more bets earlier until you leave, then they resume normal procedures. Online casinos generally adopt a “prevention is better than a cure” approach, so they can avoid roulette computer players winning large sums, even if it means they will ultimately earn less from other players. After all they can’t physically see who the players are. 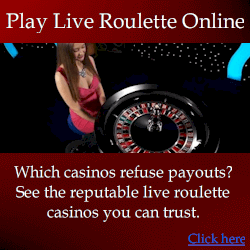 So online casinos usually prefer less risk in exchange for less but more assured profit. More experienced casinos tend to allow late no more bets to maximize their profit, but are more vigilant in detecting roulette computer players before they do damage. But even in such casinos, a professional team can easily avoid detection. Q. Can you do demonstrations from online casinos? My internet connection isn’t fast enough to download live video from online casinos while simultaneously uploading video for you to see. But what we can do is you pre-record spins from an online casino for me to test on. Then when it’s time for the demo I download the video to conduct the demo. It will be the first I’ve seen the video so it wont be possible for me to cheat. Then I’ll play the video while you watch me get predictions with the computer. If you choose this option, I’ll need video with a reasonable view of the wheel, and smooth frame rate. You should have 150 spins for one direction (testing in one direction only saves time). And the video must be continuous and uncut to ensure the wheel wasn’t changed mid-play. Most online casinos close bets before the ball is released but at least you will see prediction accuracy on a wheel you know I don’t control. Before you take the time to record the required spins, send me a small sample recording and I can tell you whether or not the video is suitable. Generally avoid the auto wheels and focus on live dealer wheels. We can often beat auto wheels but they’re more difficult, so we usually avoid them. The wheel I own is one of the most common designs in the world. It is maintained better than most casino wheels, and is more difficult to beat than average wheels. So it is suitable for testing. We can even disassemble it so you see it hasn’t been modified. But if you want to see a demo on a wheel I don’t own, you can record spins from an online casino. I recommend using the free software from https://obsproject.com/ – see the instructions below to record videos. There are many online casinos that provide good, clear and smooth video. The wheels in real casinos are mostly the same models you’ll see at online casinos. You can see demos in-person with me, but I do not send you a free full version computer to test. But perhaps you want a demo on the exact wheels you intend to play on. As a compromise, we can test on videos you record from inside your casino. Usually a well-hidden mobile phone is all your need. You can have another player connect to the phone via Teamviewer.com software to stop and start videos, and to make sure video is still recording. Remember you can’t see the phone screen in the casino. Make sure it’s legal. Sometimes recording video inside the casino is illegal. Usually if the roulette computers aren’t legal there, recording video wont be legal either. Record at least 150 spins for one direction. We could test both directions, but testing only one direction saves time. The video should be clear and steady. The videos should clearly show each winning number. Otherwise accuracy can’t be assessed. Video resolution not greater than 720p (1280 x 720). Keep it as small s possible, while still being clear. Otherwise the video is very large and difficult to work with. Try to capture when bets are closed. This will give you an idea of whether or not predictions were in time to bet.